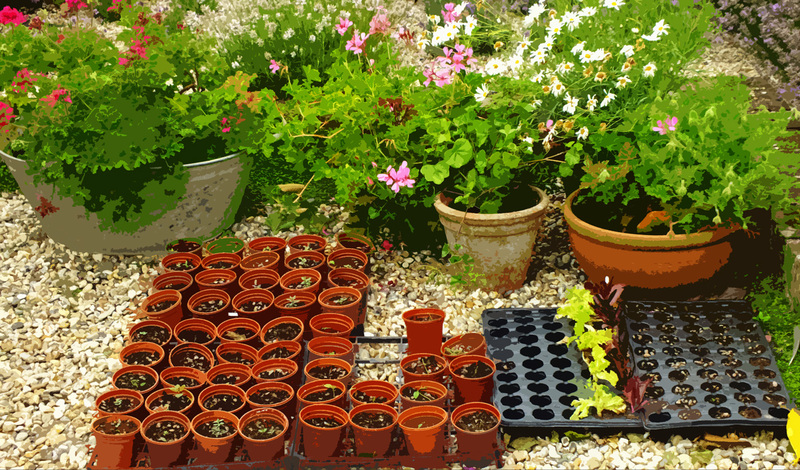 Immediately I read the word ‘container‘ I think of plants – in pots. 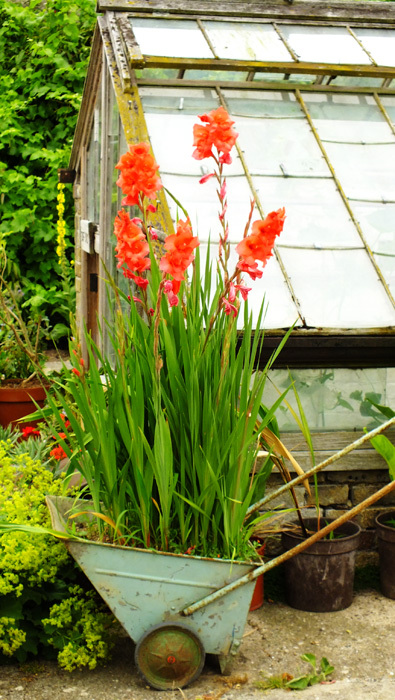 As someone who only has a container ‘garden‘ I am always on the lookout for ways in which to grow such plants and the type of containers used. 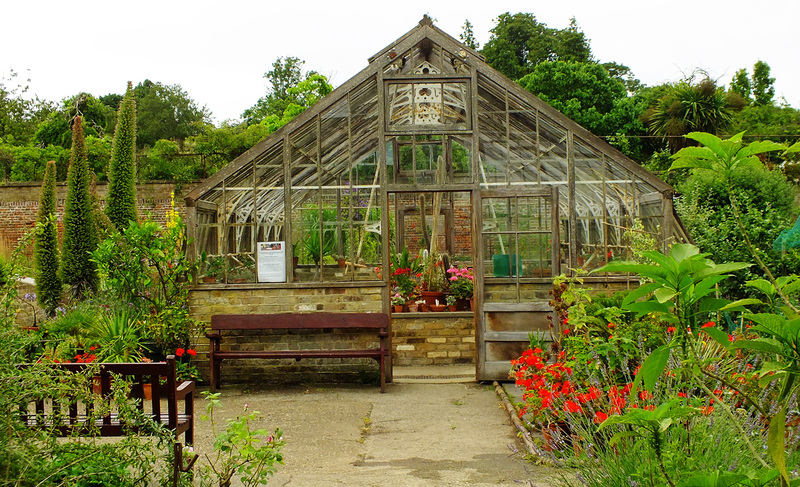 A glasshouse, is of course, a container too since its job is to contain plants that otherwise would not survive outdoors. 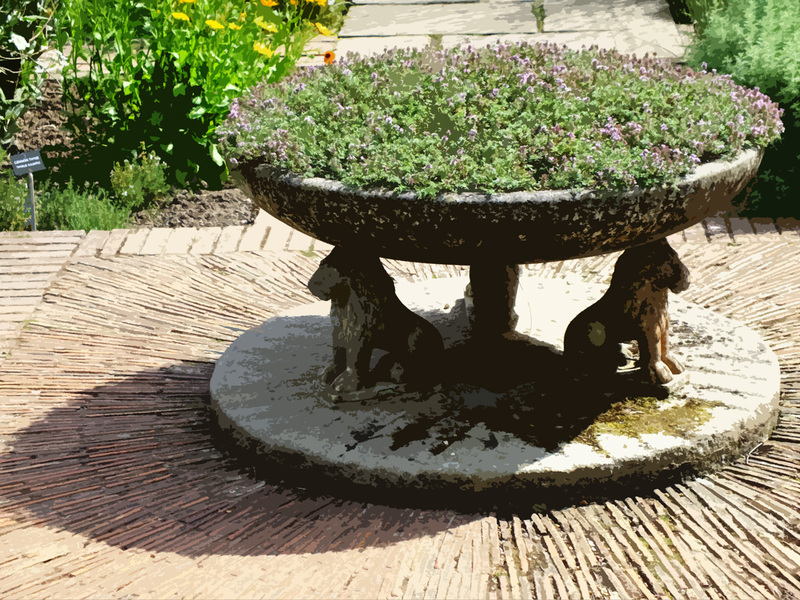 or what about this lion-guarded bowl of thyme in the Herb Garden at Sissinghurst Castle Garden? That lion bowl is very impressive, but it might look a tad pretentious in my humble garden. I love that lion bowl! And it is actually quite modest – would make a nice bird-bath too I think. They are all so charming and inviting. I greatly miss my larger outdoor spaces in previous homes, but container gardening has come into its own. Have you tried, or do you have anywhere to try, the wall devices for vertical gardening? I am putting that on my project wish list to research whether that might be feasible on any of my outdoor walls. Would love to hear some recommendations for apparatus or plants that work well for that. Well that’s a lovely gift to leave them. I have considered growing honeysuckle here around the wrought-iron railings, but figure it would be difficult to move. I adore the wheelbarrow – it would look very at home in our garden! What a great variety of containers. I really enjoy everyone’s riff on a theme, and the way their blog identity shapes their take. You of course do gardens, but with unexpected twists like the glasshouse; and your signature tilt and your whatever-you-did-to-the-white-flowers-with-the-purple-hearts. My favourites? The statue, and the wheelbarrow with its long stalked denizens. 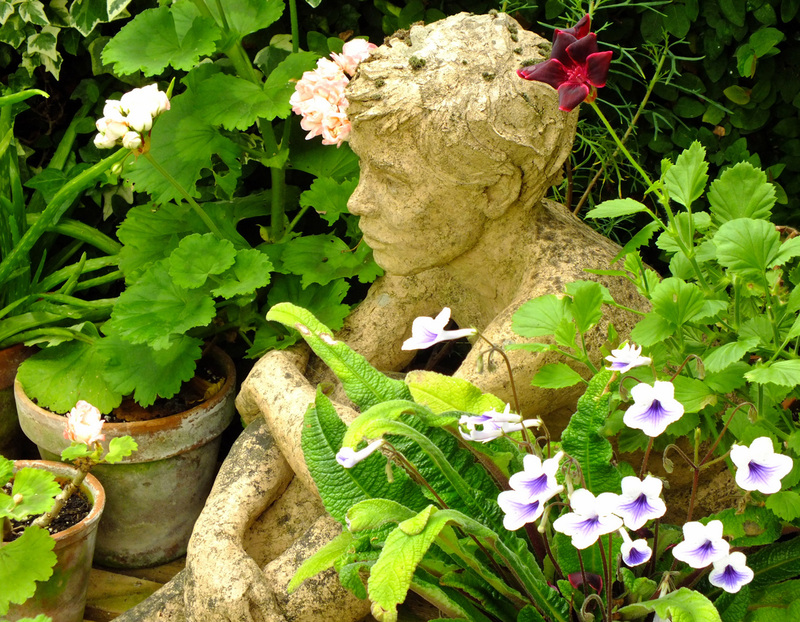 I wanted to buy the statue in the greenhouse – he looked so lovely amongst the pots of Streptocarpus (Cape Primrose) and Pelargoniums. My sort of place. I suppose I should have posted this on the garden blog. Love the urns and the barrow, and that ‘faded out’ job you’ve done. It’s ok- I still have my Monday walk to do for me, too 🙂 Spent most of today socialising on here. Lost a life! The simple terracotta pots are my favourite, although I’ve seen a few big ones on my travels that I’d like! They’re not cheap though are they? Even small ones if frost proof are a few quid. I do like the tall ones. Garden containers! Of course! Why didn’t I think of that? Lovely photos. Tks. Tanks. Tanks! Hahaha! Containers! Such beautiful containers and flowers Jude. Wonderful collection. Oh to have a garden big enough to accommodate both! 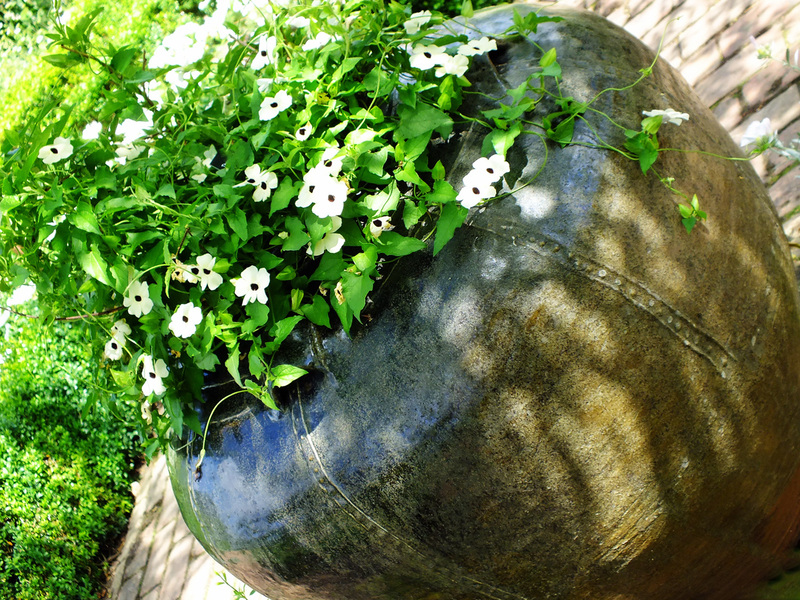 Great take on containers…I love terracotta pots. My immediate thought was to photo the containers in my garden. You have found a fabulous selection. Excellent response! I’m a sucker for the little green wheelbarrow Jude!